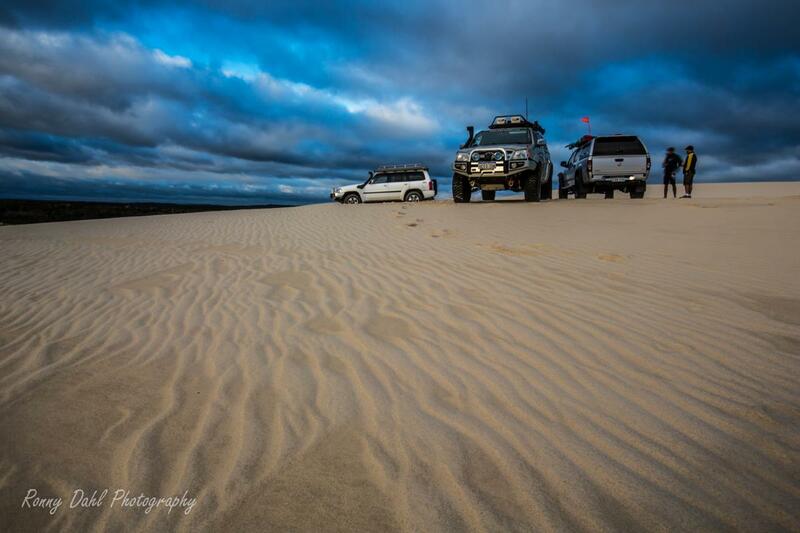 So far we have done a fair share of driving at night Off-road, on beaches, coastal tracks, bush tracks and sand dunes. Just recently we did the Powerline track with plenty of slow going tricky sections. I struggle to put the experience in a few simple words. At night you really get tunnel vision and all your senses are intensified, everything looks different and vision is only where the lights are shinning, this gives a slight eerie feel. Driving at night off-road is all about lights, lights, more lights and your mate’s lights! Having high beams and fog lights is just not enough! Spot lights do help but nowhere near as much as LED light bars with a spreading patterned light setup. Now, you won't need to have a bucked load of lights to drive at night but it will make it far easier to avoid hitting something. If just one or two vehicles in the convoy have a light bar it can help everyone immensely. Don't be fooled by shadows. That shadow on the other side of that little hump could be a drop off, pot hole, a deep rut or anything else; this is why multiple lighting options are key. 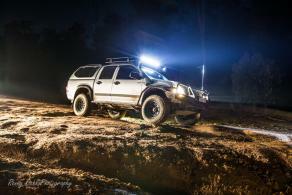 Most recently we were at the Mundaring Powerlines for the first time driving at night. 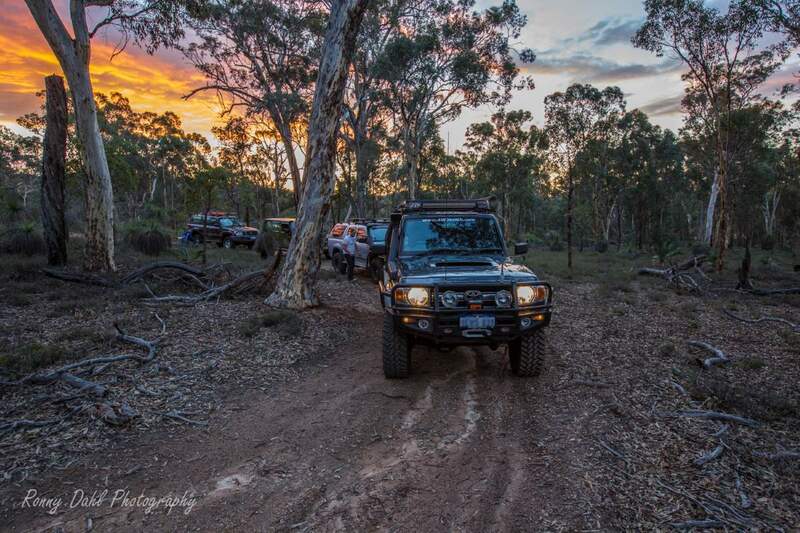 For those who don't know what the Powerlines are like, well its best described as a 4wd playground. A place to test a 4WDs limit and your skills as far as you wish. This place at night is completely different and so are all other areas. With a place like the Powerlines extreme caution is paramount, one wrong move and anything could happen. Holes and drop offs are extremely hard to see in the dark. 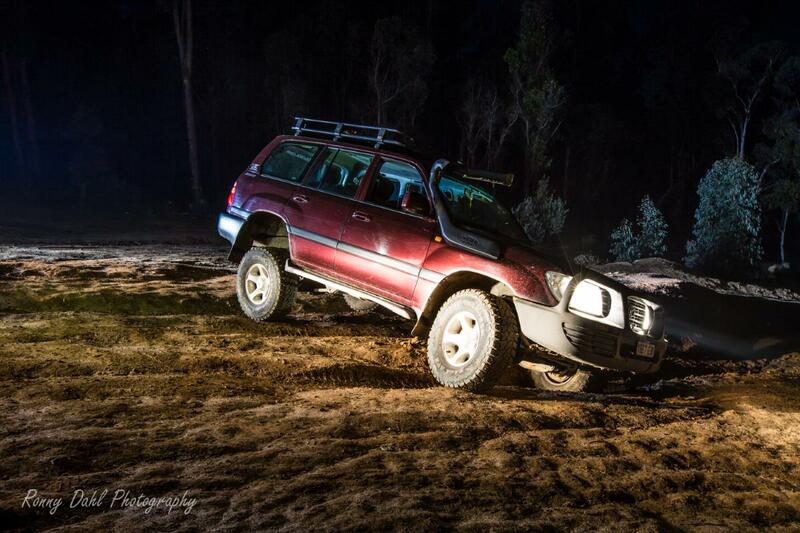 Night driving, 105 series LandCruiser. Jeep Wrangler at night on the Powerline. When beach driving the shoreline is rarely visible when driving along the beach, unless you are driving close to the water. A LED light bar will help provide spread but still won't really give you good visibility of the shoreline. 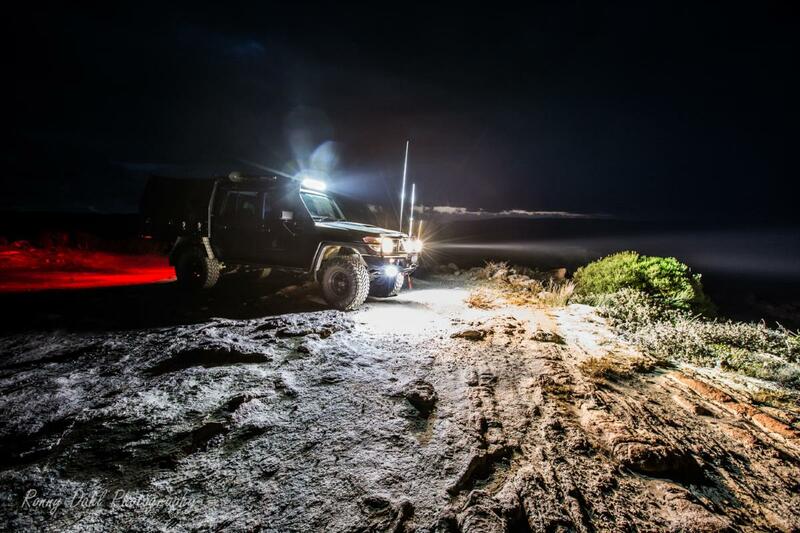 The Land Cruiser at night along the Bremer Bay coastline. Spot lights will provide good distance which is pretty important when driving on the beach. This will provide early warning if the beach gets narrower before you get there and possibly end up in strife. It's also great for spotting fishermen from a distance on those hard beaches that allow for faster speeds. Rock lights won't help much at all with beach driving. Rear lights (reverse/work lights) are great for beach driving when bogged as you can actually see behind the vehicle when digging etc. Also great for vehicle to vehicle recoveries. Most recoveries are done with a vehicles front facing another vehicles rear, lighting up both vehicles works wonders! Adjustable lights mounted to the roof rack will be ideal for keeping an eye on the shoreline (providing you are close or the light is quite powerful), also very useful for fishing! Sand dunes are dangerous at night (that's an understatement); I personally have driven sand dunes 3 times in very low light. The best way to tackle sand dunes at night or low light is to follow your own previous tracks and have a very good memory as remembering in reverse is not always as easy. Be very careful as some previous steep descents are now "steep climbs"! Driving sand dunes in the dark which were not travelled earlier in the day is highly not recommended, even with a good setup of 4x4 lights! LED light bars, spot lights and work lights are required in my opinion! Rock lights won't assist much at all with sand dunes! Adjustable lights will be a great addition for this kind of night driving situation. Sun has just set deep in the sand dunes, time to return before it gets dark. 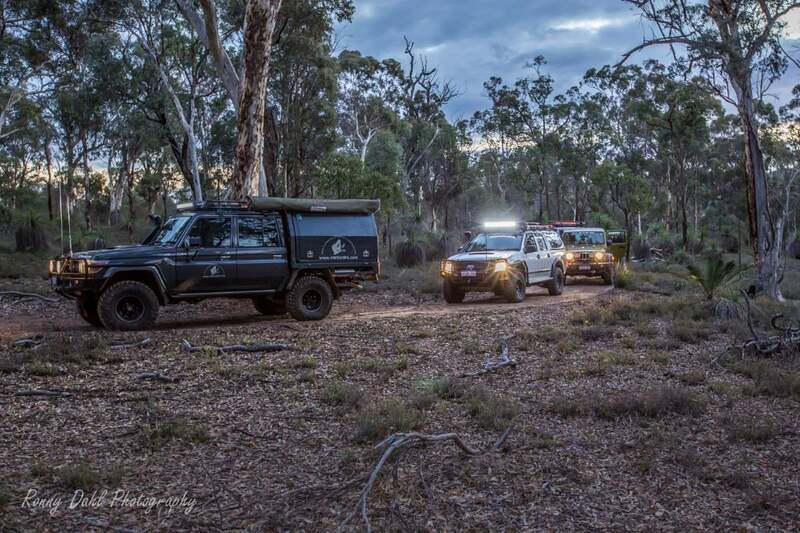 In my opinion the hardest part about night driving along bush tracks is turning around on the track or doing 3 point turns (in the cruiser it's more like a 10 point turn!) and reversing. Also very noteworthy is the fact of over shooting side tracks or completely missing side tracks is common as all you can see is right in front of you! Unless you know where exactly you are going or know the area very well turns onto hidden tracks will be missed or at the very least over shot at speeds more than 30kph. Bush tracks benefit from every light possible. Coastal tracks are very much the same as the bush tracks except for having more visibility as there are rarely any trees along the coast, also the is the extra danger of sand dunes which show no signs of recent tracks. They must be carefully checked as recoveries are very hard at night also making them tougher to do safely. Great for slow tight tracks and must have for gravel roads to help prevent animal strikes! 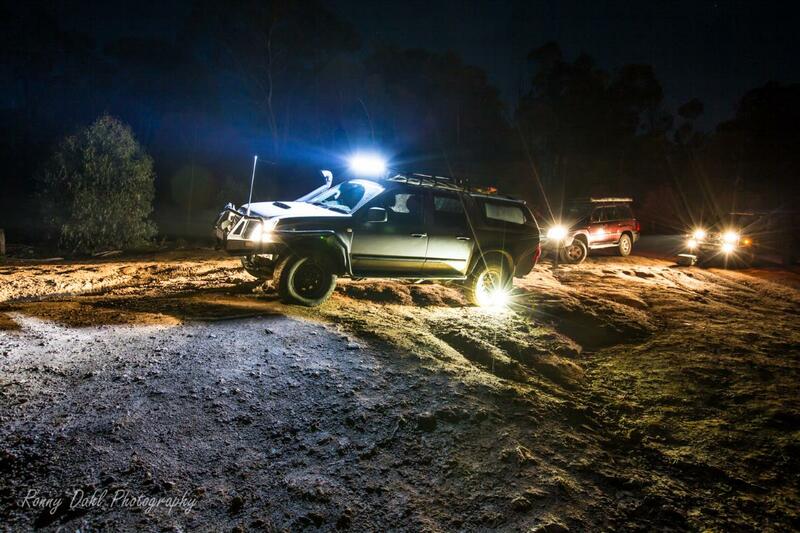 Superb for night bush tracks and gravel roads, any wildlife on the edge of the track or road will be visible. The LED light bars also really help lighting up the track ahead very well for 30-70m depending on the strength/lumens the light bar produces. Great for those slow tricky sections such as ruts, pot holes, fallen trees and of course rocks! They can assist both the driver and spotters. Well as I mentioned before reversing is pretty though in the bush at night on those tight tracks so rear lights will assist immensely. Also great for recoveries as most recoveries are done with a vehicles front facing another vehicles rear, lighting up both vehicles works wonders! Great option for any situation i.e. Recovery, slow tricky section and assisting in finding side tracks. 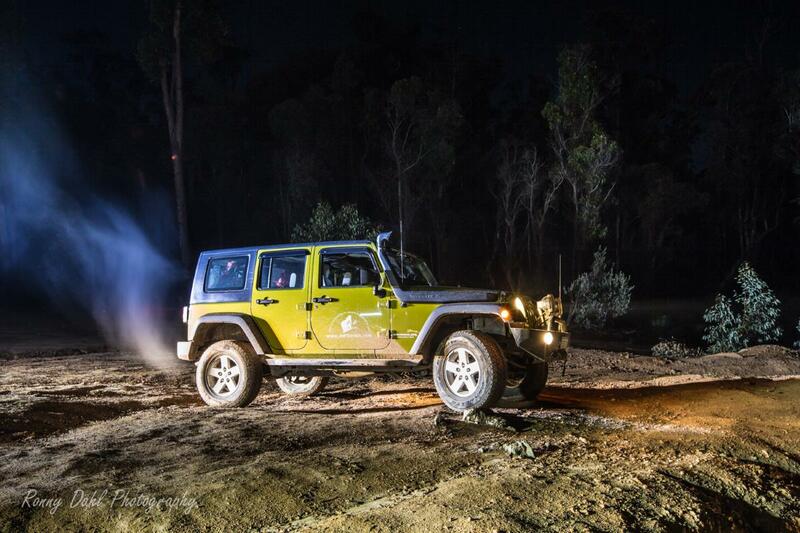 Leave Driving At Night And Go 4 Wheeling In Western Australia.